Tiny outside, friendly inside. There is room for everybody! It’s all it takes to create unforgettable memories in the Cameravan. 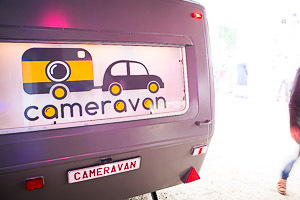 If present on your event, Cameravan will be noticed! You can’t miss it. 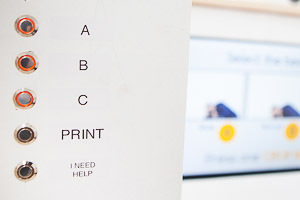 In no time you can collect your printed pictures outside. In the Photo Booth you can’t help laughing. Would you take up the challenge to stay serious? “The best way to multiply your happiness is to share it with others”. Share great moments with Friends, Fans and Followers. 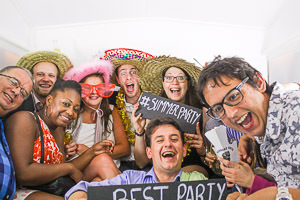 Our Photo Booth can handle both. 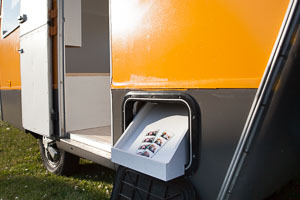 Cameravan is quickly ready to share the fun! Created into a wonderfull 1972 Sprite 400 Caravan, this mobile Photo Booth is the perfect gadget for weddings, parties and special events. Cameravan is a unique way to immortalize unique moments. 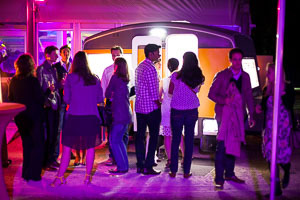 Ready to use in less than 30 minutes, Cameravan will make your event much more fun. 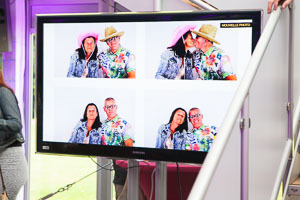 Each guest will have a fantastic photo experience and receive 2 photo strips. Pictures can be instantly shared with guest’s friends on social medias! Vous cherchez également un photographe pour votre événement? Contactez-nous, on a ce qu'il vous faut ! 2015 © Cameravan by SL-Services. Cameravan est une marque déposée.